Yesterday I posted an article from the Chicago Tribune describing the tragic events of 6 January 1890, in which my great-great uncle John Knoch lost his life. That article named him as John Knox. Below is my transcription of the Fort Wayne (IN) Gazeete from 11 January 1890 which positiely identifies that John Knox as John Knoch. JEFFERSONVILLE, January 10. - The efforts to recover the bodies in the bridge caisson by pumping in air have been given up and in the morning men will be sent by the excavation shaft. It is hoped that the thirteen remaining bodies will be taken out and an inquest will be held at once. The body of Hamilton Morris was recovered in the pipe at the top of the sand before the machinery broke to-day. A telegram from Mr. John Knoch, sr., of Detroit, Mich., asks for the body of his son, John Knoch, not Knox as heretofore sent out, who was foreman of the men drowned. Also William Naylor, of 3,313 Atlantic street, West Philadelphia, asks for Pat Naylor. The relatives of Frank Mahar, of Newark, N.J., and James McAdams, Hyde Park, Pa., have not been heard from. [Illegible]smith & Co., contractors, claim through General Superintendent Willard, that the accident was not due to negligence, that Knoch was an especially competent man as shown by previous work here, and that he wasn't drinking, as they employ no drinking men. The story of Louis Couch, one of the men who escaped, is that Knoch disobeyed Superintendent Mitchell by letting the caisson down eighteen inches at a time instead of three inches, as directed. He says, too, that Knoch turned off the air completely after the caisson was lowered, instead of partially, and the rush of water and sand followed at once. Others who escaped corroborate this. Night Superintendent Murphy says that in a life in the business he never saw such an accident, and lays the blame on Knoch. Joe Fahringer, who was in the pumping-boat, says he ran to the mouth of the escape pipe as soon as he heard the ruch of air and met Abe Taylor and others as they came out, and they all tried to close the lower door of the air-locks, and save the others, but found it impossible. "Two serious caisson accidents have happened here during the year. By the first, January 9, fourteen men were drowned, owing, according to the coroner's finding, to the men losing their presence of mind, and not from any fault of the contractor." John is not mentioned specifically, nor is the blame placed on any one man, but it's clear that the accident was ultimately attributed to human error - at least by one body of experts. I haven't posted much of anything about my own family tree yet, instead remaining focused on my wife's lineage. My father spends his days of retirement tracing down the Knoch ancestry, a project I began more years ago than I care to mention, and I have been content to simply reap the rewards of his research. A couple of weeks ago he brought to me a bit of a mystery he'd uncovered while examining his grandfather's siblings. It seems that the death certificate of his grandfather's brother, one John Knoch, indicated a place of death as Louisville, KY. That in itself is interesting, since until that point we had thought that my move to Kentucky from Michigan was the first such venture undertaken by any member of the Knoch clan. The circumstances of John's death were also a bit of a mystery, as he was only 28 years old at the time of his passing in January of 1890 and the cause of death was listed as drowning. Census records indicated that John was a bridge builder by trade. Given that Louisville rests upon the Ohio River, it seemed very plausible that John was the victim of an on-the-job mishap. 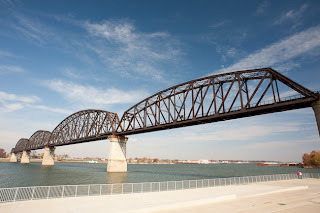 I began to dig through what I could of Louisville's history to determine if in fact a bridge was being constructed at the time of John's death, and sure enough one was - the Big Four Bridge. You can read more about the bridge itself at Wikipedia, where I learned that there was a large loss of life due to a collapsed caisson. I mentioned this to my father, and he began to scour the digitized archives of various newspapers in circulation during that time period. It wasn't long before he discovered that the caisson had collapsed on 6 January 1890, the same day as John's death. An article in the 10 January 1890 edition of the Chicago Tribune describes in detail the accident, the survivors, and the deceased. The article mentions a John Knox, but that spelling is later corrected in an article from the Fort Wayne (IN) Gazette dated 11 January 1890 (on a side note, proving that our particular pronunciation of the surname has a very long history). The matter is further intensified when both articles name John as the cause of the accident, and subsequent deaths of thirteen other men. John is not the first Knoch of our immediate line to have been responsible for a large loss of life, as his uncle in Detroit allegedly murdered the majority of his own family. I say allegedly, since he was never convicted, but there is significantly strong circumstantial evidence that points to him as the perpetrator. That, however, is a story for another day. Unfortunately we couldn't find any Louisville papers online, so I'll be heading to the state archives in the next couple of weeks to dig further. In the meantime, I've transcribed the Chicago Tribune article below, since the image I have is unreadable at anything but the full 8MB resolution. I'll transcribe the other articles soon. I've driven by the Big Four Bridge many times since moving to Kentucky, and always thought it a curiosity. Driving by it now, with caisson Number 1 looming just offshore, brings entirely different thoughts. LOUISVILLE, Ky., Jan. 9. - The most appalling accident known here in many years occurred this evening about 6 o'clock, fourteen lives being lost. HAYNES, WILLIAM E., 40 years old, No. 214 Clay street, Louisville. KNOX, JOHN, 28 years old. McADAMS, JAMES, 26 years old, Hyde Park, Pa.
MAHAR, FRANK, 23 years old, native of New Jersey. ASH, THOMAS, colored, 30 years, Henderson, Ky. BOWLING, MONROE, colored, 34 years, Henderson, Ky.
CHILES, CHARLES, colored, 30 years, Henderson, Ky.
JOHNSON, THOMAS, colored, 30 years, Henderson, Ky.
GORDON, JOSEPH, colored, 25 years, Henderson, Ky.
MORRIS, HAMILTON, 20 years, Henderson, Ky.
SMITH, THOMAS, 27 years, Henderson, Ky.
SOAPER, fRANK, colored, 25 years, Henderson, Ky.
TYLER, ROBERT, 16 years, Henderson, Ky. The men saved are all colored, as follows: Abe Taylor, Lewis Coch, and Frank H. Haddix, all of Henderson, Ky. It was nearly time for work to stop all over the city, and workingmen were expected home by their families when the report spread rapidly that there was a wreck or crash of some kind at the new bridge now under contruction between Louisville and Jeffersonville. A caisson had given way and the workmen employed in it had been drowned or crushed to death by stone and timbers. The caisson known as No. 1 was about 100 yards from the Kentucky shore. As the workmen of the pumping station were looking for the men in the caisson to put off in their boats leaving work for the night they suddenly saw the low dark structure disappear in dashing white waves, and heard, before they could realize what had happened, the roar of the furious maelstrom. A runner was dispatched to the life saving station, and three skiffs were manned and pulled to the scene of the wreck. Word was sent to the police station and a squad was at once ordered to the ground to aid in the work of recovery. The Coroner was called and went with a corps of physicians. The site of the bridge is at the upper end of the city, just below Tow Head Island. Within an hour from the disappearance of the caisson 3,000 people were on the shore and strained their eyes trying to see something of the wreckage. Dozens of boats were plying about over the spot where the caisson had stood, and lights danced to and fro with them, but there was no trace of the massive structure of stone and timber which had kept off the hungry river to promise any hope to the anguish-stricken mothers and wives who stood in the throng on the shore. The water rolled sullenly but smoothly down from the coffer-dam above the pumping barge below where the caisson had stood. It was soon known that only four of the eighteen men who were at work at that time had escaped. The last man out of the caisson was Frank Haddix. He was barely saved by Murray, who dragged him from where he was caught, waist deep, in the quicksand. Taylor says he stood nearest the iron ladder by which they got in and out of the caisson. He heard a rumbling, and there was a rush of air almost at the same instant. He jumped up the rungs of the ladder, followed by the other men. They had hardly got clear of the caisson when the water burst through the man-hole in a surge, knocking them all into the river, where they were picked up. Haddix says he saw Ham Morris, who was climbing next below himself, swiftly drawn under by the sand, and heard his cries for help, but could do nothing. The caisson is not wrecked, as at first supposed, but has settled down in the bed of the stream completely filled with sand and water. The pumping station is hard at work clearing the way to the bodies, but none will be reached tonight. There seems absolutely no hope for any of those caught within the caisson. John Knox, the gang boss, took charge of the work Monday. The negroes who escaped say he had them dig too deep before letting the caisson settle, and the digging was too close to the shoe of the caisson. Just before the accident Knox gave some order to Robert Baldwin, the keeper in charge of the upper door to the exit. Baldwin then opened this door, and the compressed air which kept out the river rushed out, letting in the stream. The men say they were working in an ugly quicksand at the time. The caisson was about forty feet by twenty and built of timbers twelve inches square. It was protected by a cofferdam, but the river is high and the pressure of the water great. 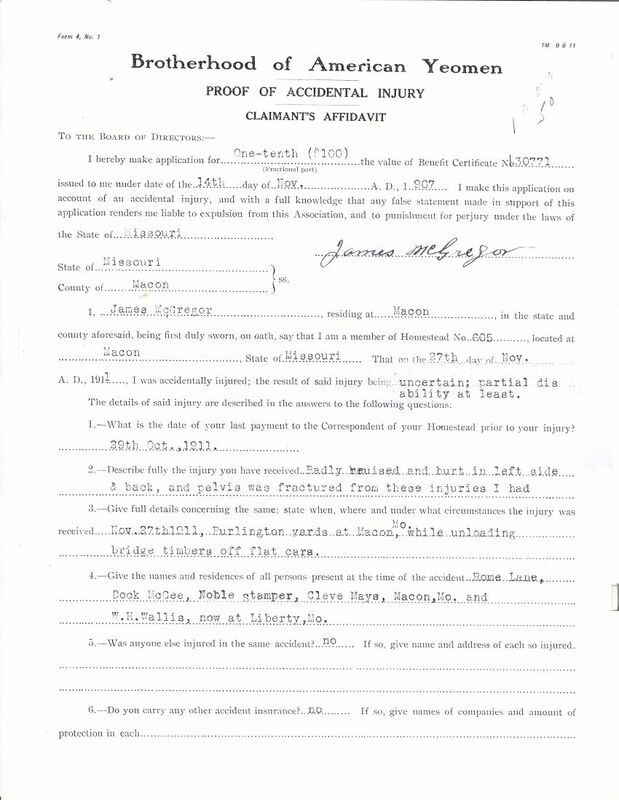 Another interesting set of documents included in James McGregor's probate records pertain to an on-the-job injury he sustained in 1911. At that time, James was a station hand working for the Burlington railroad in Macon, Missouri, and had held that position for 10 years. Then, on the 27th of November, an accident happened that appears to have changed, and may have ultimately ended, James' life. Five documents make up the Brotherhood of American Yeomen Proof of Accidental Injury packet. At first I assumed that the Brotherhood of American Yeomen (BAY) was a type of labor union, but once I dug into the organization I found that it was actually a fraternal insurance society associated with the Iowa State Insurance Company, through which James maintained several policies. It's clear from the affidavits that James' injury was severe enough to warrant a claim, and that his career was ended by the events of that November day. According to James' statement, signed on 24 February 1912, he was unloading timbers from a rail car when somehow the 10-foot long 8x10 ties broke loose. Eight to ten beams fell on top of James, breaking his pelvis and severely bruising his left side and back. He was confined to his bed for six weeks and to his home for four weeks after that. Two physicians attended James, a W.H. Miller and an A.B. Miller, and both of their statements are included in the package. Both of their accounts and diagnosis are similar, with their answer to one of the questions being of particular interest. Question number 11 asks "Will claimant recover from accident in the ordinary course of treatment?" Dr. W.H. Miller simply states "do not know" while Dr. A.B. Miller writes "I cannot tell. He is slowly improving." 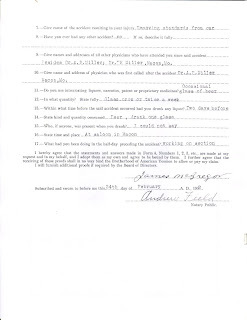 According to James' death certificate, he died from sepsis with a contributing factor of tuberculosis prostate, a condition he suffered from for 2 years - or since early 1912 or late 1911. I'm certainly no medical expert so I cannot say if James' accident contributed to the onset of this disease or was simply a coincidence. I can conclude, however, that the events in the rail yard on November 27th, 1911, ended James' career. Besides shedding light on the injury, the affidavits also give a glimpse into James' every day life. His own questionnaire (pictured below) shows James to be fond of a beer now and then, having last visited a "saloon" two days prior to the accident. There is also a form from a correspondent, or witness, named Mrs. Elizabeth Miles who was a seamstress in Macon. She's essentially a character witness, having known James for 3 years and confirming James' own description of his lifestyle. 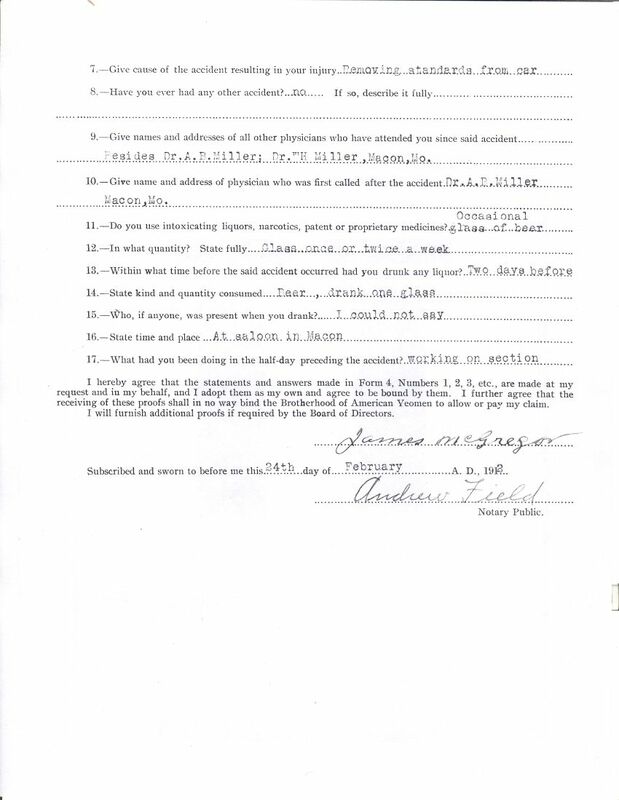 The final affidavit in the package was completed by F.T. Skinner, James' foreman, who also knew James for 3 years prior to the accident. 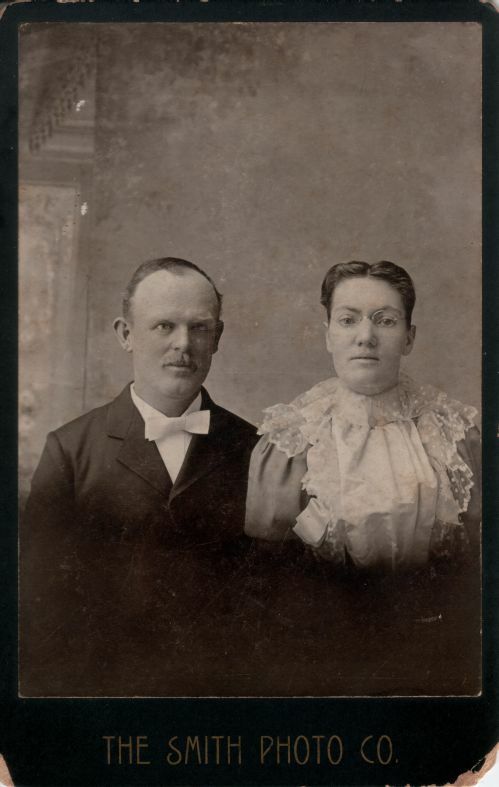 My wife's new-found cousin has been kind enough to send some scans of family photos our way, and of those we've received thus far the most cherished is this photo of James and his third wife Ida "Giddie" Calhoun. I am uncertain of when the photo was taken, though judging from their clothing I would assume this is a wedding photo and would be dated around 24 December 1897. It is credited to The Smith Photo Co., but I can find no information about that entity. 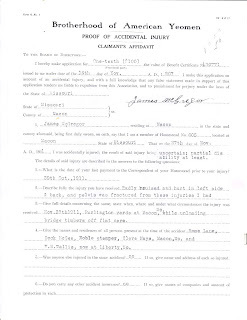 Back in August I blogged about my James McGregor brick wall and mentioned that I had sent away to Macon County for his will and probate records. Well, the packet arrived a couple of days ago and I was very pleased with the wealth of information, and number of surprises, it contained. As to the big question about James' origins, the documents didn't contain even a hint of an answer. They did, however, reveal some details about James' life that were previously unknown to us. The first document in the packet was James' will, handwritten on the 3rd of February, 1914 - the day before he died. It was obviously written by someone else's hand, for James' scratchy signature is at odds with the rest of the handwriting on the page. The will revealed the expected - dissolution of his estate, with the proceeds distributed among his children Robert Lee, James, and Opal - but the valuable information began to be revealed immediately. We learned that James' (the son) middle name was Pleasant, after James' (the father) father-in-law. We also learned that Giddie Calhoun was actually James' third wife! Until now, nothing we'd found mentioned previous wives - or children. The will revealed both. Wife Number 2 came on the scene. James married Emma Bundren on June 16, 1886, in Macon County. With Emma he also had a daughter, May. I could find no birth record for May, but additional contents of the probate packet places her age in 1896 at 8 years. Those additional papers are the divorce decree issued in Arapahoe County, Colorado on February 25th, 1896. Did James spend time living in Colorado? It turns out that he did not, but his wife certainly did. The same year that her divorce from James was granted, she married a man named William Baer - in direct violation of the divorce terms which stated that neither party was to marry within one year. James married Giddie Calhoun on Christmas Eve 1897, but Emma's circumstances seem shady. William Baer was also from Missouri, so there's circumstantial evidence to believe that the two ran off to Colorado. It would certainly be interesting to know the whole truth of the matter. There are many more documents and other interesting tidbits of information contained in the probate records, but this post has become quite long so I will share the rest in subsequent installments. For family historians, discovering who our ancestors were and where they came from is what drives us to spend hours upon hours pouring over records, indexes, photographs and newspaper clippings. Equally important and rewarding, however, is the opportunity for discovering previously unknown (or long-lost) living relatives with which we can share being a part of the same family. Yesterday I had just such a breakthrough. Back in August I detailed my James McGregor brick wall which prevents me from peering further back down the McGregor family line. I decided to attack the problem using a linear approach - digging for more on James' two other children (Robert Lee, James' other child, was my wife's great-great-grandfather, so I have his descendants pretty well researched). I knew the birth date and place of James' son James, but little else. For his third child Opal, however, I had a lot more to go on. One item of interest was her obituary. A month ago I blogged about the value of obituaries, and so I'd hoped to strike gold (or at least some silver) by looking for Opal's survivors. Opal had two sons listed, Wendell and Jerry. I hit the 'net and found Wendell rather quickly. Unfortunately, it was his obituary from Wisconsin. I'll be sending away for a copy of it soon, but in the meantime I returned to my searching and focused on Jerry. I found a match in both name and location, but the only additional info I managed to learn was his mailing address. Cheryl typed up an introductory letter containing her contact information and snail-mailed it to California - fingers crossed. Last night an email popped in from Jerry, and he confirmed that he was indeed Cheryl's first cousin (twice removed)! As an added bonus, he had been doing his own genealogical research and mentioned having boxes of photos, records, and newspaper clippings that he'd be more than happy to send our way. Besides the prospect of knocking a few bricks out of the James McGregor wall, Cheryl has reached out and connected with a member of her family that she never knew existed. Jerry mentioned that he thought his branch of the family had lost touch with his uncle Robert's branch (Cheryl's g-g-grandfather) forever, so he seems equally thrilled at this discovery. This is what makes those long hours so worth the effort. 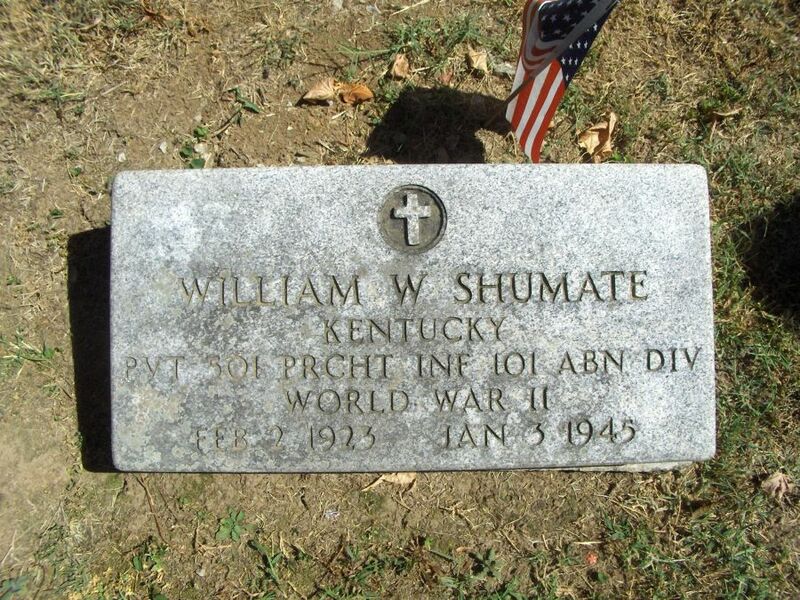 Private William W. Shumate is one of Scott County's few casualties of the Second World War. He was drafted the first of April, 1943, and as a member of Company H of the 501st Parachute Infantry Regiment, 101st Airborne Division, he likely saw action during D-Day, Operation Market Garden, and the Battle of the Bulge. The war for Private Shumate ended on January 3rd, 1945, at Bastogne in Belgium. Ironically, most of the intense fighting suffered by the "Battered Bastards of Bastogne" had subsided by the end of December, 1944, with only sporadic action occurring after the first of the year. Without his service records, the circumstances of Private Shumate's death remain a mystery that deserves to be solved.